A screenshot from an ad for George Scott's congressional campaign. A Democratic candidate for Congress in Pennsylvania has made his position on gun control — specifically when it comes to assault rifles — known by throwing a firearm into a campfire. George Scott, a veteran and pastor who is challenging U.S. Rep. Scott Perry in the newly-formed 10th Congressional District, released an ad Wednesday in which he touted his military service, noting he's been trained to use weapons like the Smith & Wesson M&P 15-22 rifle he's holding. In the video, Scott says "Donald Trump's loyal soldiers like Scott Perry exploit guns and God to score political points." 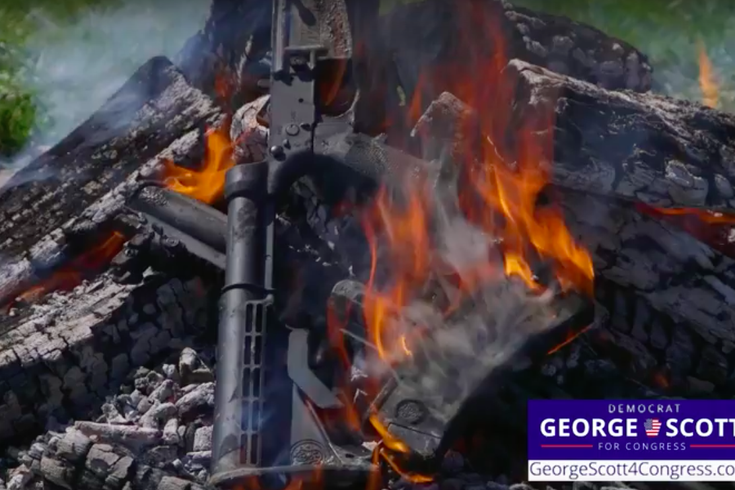 Scott takes apart the weapon, throws it in the fire and says he's for "common sense" gun laws, which the ad says include mandatory background checks and banning assault weapons "meant for war." According to PoliticsPA, Scott is running against three other candidates for the Democratic nomination to challenge Perry, a three-term incumbent. Perry, also a veteran, has strongly advocated against stricter gun laws. Last year, he introduced the "Second Amendment Defense Act," which sought to push back against Obama-era regulations.